1 person out of a maximum of 100 entries to win £30 worth of bespoke garden ornaments! 100to1shot.com Online Competitions would like to offer you the chance to win this collection of beautiful bespoke hand crafted garden ornaments courtesy of Stone Hand. These beautifully hand crafted unique ornaments are made from recycled materials designed to add interest and beauty to your garden. 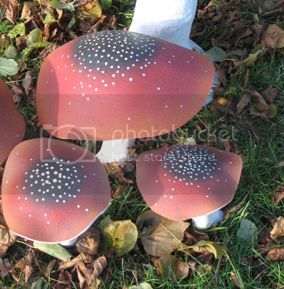 This beautiful prize consists of a cluster of 3 hand crafted mushrooms, The stems of these products are made from cast concrete, rot proof and stable, both in the garden and on the mantelpiece. The caps are manufactured and sculpted from waste materials, collected from local sign and exhibition companies who would otherwise put such offcuts into the waist skip, destined for landfill.